Without melodrama, without even an actual plot, Cranford develops at the gentle pace you’d expect from an early-Victorian small town. Elizabeth Gaskell is the Queen of Domestic Life and from page 1 the reader is immediately involved in the small pains and pleasures of a group of middle-aged genteel women. With just a few anecdotes, she is able to build distinct individuals and I was often left with the vague impression I actually knew someone who, as Miss Matty and her candles, is obsessed about saving something or other, or who would defend his/hers favorite author as devotedly as Miss Jenkins’ did her Dr. Jenkyns (the dialogue in that scene is priceless). The greatest event was, that Miss Jenkyns had purchased a new carpet for the drawing-room. Oh, the busy work Miss Matty and I had in chasing the sunbeams, as they fell in an afternoon right down on this carpet through the blindless window! (…) We were very busy, too, one whole morning, before Miss Jenkyns gave her party, in following her directions, and in cutting out and stitching together pieces of newspaper so as to form little paths to every chair set for the expected visitors, lest their shoes might dirty or defile the purity of the carpet. Do you make paper paths for every guest to walk upon in London? What a great image, I’m sorry they didn't use that in the series! Cranford is my fourth Gaskell after North & South, Wives & Daughters and The Life of Charlotte Brontë. In comparison it’s much lighter and I can easily imagine Gaskell having fun writing it. She avoided the major social convulsions and deep moral dilemmas of the others, but her recurrent theme of tradition vs. progress is still very much present in Cranford. Change in this village does not come through the arrival of rail line or a factory, but is more subtle. Almost every chapter is about how these women gently adapt to the developments around them, especially after the death of Miss Jenkins, the village’s bastion of tradition. Sucking oranges in company, burning old letters (why didn't the narrator offer to take care of them?!) had the scale of revolutions in the quite life of Miss Matty. Don’t you sometimes wish that a separate story would be written about another book’s secondary characters? I get that a lot – the one that comes to mind immediately is Faramir from Lord of the Rings (one of my biggest literary crushes!). I got that same feeling about “Mr. Thomas Holbrook, yeoman”, my favorite character in the first half of the book. I would have liked to know more about his daily life, what he reads, his relationship with tenants and servants, but most of all, I’d have liked to see Paris through his eyes. I was very sorry to see him go so soon. I had fun during my stay at Cranford. Not only was it a gentle book, full of characters you’d like to know in real life, but it also confirmed my belief that no one tops BBC when if comes to adapting classics. I still have the “Return to Cranford” DVD waiting for me on the shelf. I've been saving it for a rainy day. 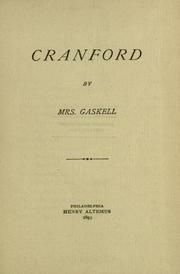 Cranford and Mrs. Gaskell's other books are available at Project Gunteberg.